How to get in touch with the Apple iTunes customer service? Apple is one of the largest tech giants in the world millions of people using an iPhone across the globe. Apple has so many amazing products like the iPhone, iPod, Apple Watch, iMac, etc. which can help us a lot in our day to day activities. But at the end of the day, all these products are electronic devices that can get damaged or have some issues without any prior notice. To top that, a lot of people have complained that every iOS upgrade is accompanied with a lot of bugs that make the phone lag. Using an Apple product can be a bit complicated. So, today we are here to tell you how you can sync your iPhone, iPad, or iPod touch with iTunes on your computer and how you can backup all of these using iTunes as well as tell you how you can connect with the customer service team. So, let us get started. How to sync your iPhone, iPad, or iPod touch with iTunes on your computer? By opting you sync your device with iTunes, you are allowing yourself to access all the information on your device from anywhere around the world. There are two ways in which you can sync your iPhone, iPad, or iPod touch with iTunes on your computer, one is doing it with the use of Wi-Fi and the other is by using a USB cable. One of the first things that you should do when syncing your device with iTunes is open the app and make sure that you have the latest version of the app. Syncing with the use of Wifi: Connect your device to your computer using the USB cable that comes along with your device. Open the iTunes app on your computer, find and connect with your device. Under the ‘Summary’ tab, select the ‘Sync with this iPhone over Wi-Fi’ option. Apply the changes and then you can unplug the USB from the devices. Once this is done, select the files that you want to sync and click on the ‘Sync’ button. You should remember that this will work only if the device and the computer are on the same Wifi network. Syncing with the use of USB cable: Once you connect your device with your computer using the USB cable, the connected device will appear on the upper-left corner of the window as an icon. On clicking on this icon, you will get a list of files that you can choose to sync with your computer. Once you click on the type of file that you want to get synced, you will be presented with additional options to optimize the sync to your convenience. Once you are done with this, click on the apply button and the sync settings will be applied to the file. You will need to repeat this for all file types individually. The iTunes customer service team can handle everything right from customer problems to support to customer care and raising issues and answering questions. If you are a resident of the US then you will be asked to produce the serial number before you can get help from someone. The US residents can call on 800-275-2273 to get connected to the iTunes customer services. 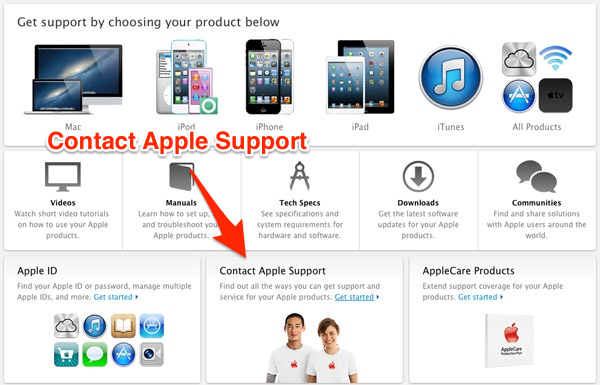 If you do not reside in the US, then you will have to go to the Contact Apple Page on their website and search for the number of the iTunes customer care support team in your country. Apple has a list of all the authorized retailers on their website where you can check which is the nearest store to you. Here, you will also find details such as address of the store, the timings for the stores and what kind of services the store provides. You can also choose to go to an authorized service provider based on the kind of service that you need. For this, you will have to check the ‘Get Support page’ on the website. You will require the serial number and the IMEI number or the MEID number of the device. Once you have entered all the required details, you will have to choose the topic that is related to your problem and select if you want to chat with the representative right away or schedule a call for later when you have the time. You can also choose to leave your contact information along with a detailed description of your problem; this will mean that the amount of time required by the iTunes Customer Service to solve your problem will be less.